In Big Bend National Park’s Santa Elena Canyon, the Rio Grande separates the United States (left) from Mexico (right). The United States and Mexico have shared their current international border for nearly 170 years. Today they cooperate at multiple levels on issues that affect the border region, although you would not know it from the divisive rhetoric that we hear in both countries. President Trump’s focus on building a border wall threatens to undermine many binational initiatives, as well as our shared natural environment. As a scholar focusing on urban planning and design in the border region, I have worked with communities in both countries to restore deteriorated urban and natural environments. I see great potential for green infrastructure – projects that use live natural systems to deliver benefits to people and the local environment. This approach can help mitigate air and water pollution, restore soils and habitats and regenerate plant, animal and human communities. I also see an opportunity for Mexico and the United States to work together on a much larger scale. Rather than spending billions of dollars on a border wall, here is an alternative vision: regenerating the Rio Grande, which forms more than half of the border, to form the core of a binational park that showcases our spectacular shared landscape. 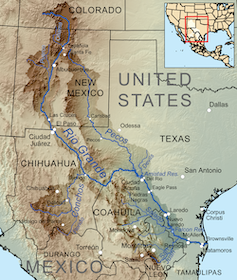 The Rio Grande rises in south-central Colorado and flows 1,885 miles to the Gulf of Mexico. Today the river’s volume is decreasing, thanks to climate change and water diversions for agriculture and municipal uses. It is polluted with fertilizers and sewage, and has lost at least seven native fish species. Restoring it would produce immense benefits for wildlife, agriculture, recreation and communities on both sides. Mexico and the United States have signed numerous agreements regulating the border, starting with the Treaty of Guadalupe Hidalgo in 1848. In 1944 they created the International Boundary and Water Commission to manage water supplies, water quality and flood control in the border region. Environmental issues that affect communities on the border include raw sewage dumping, agro-chemical pollution and flooding. Loss of riparian habitat – the lush green zones along river banks – has reduced shade and natural cooling in the river’s urban stretches. Recognizing these issues, the United States and Mexico established the Border Environment Cooperation Commission in a side pact to the North American Free Trade Agreement. This organization funds environmental programs proposed by local communities and governments within a 400-kilometer-wide strip along the border. The U.S. Environmental Protection Agency’s Border 2020 program also provides grants focused on environmental issues in the United States and Mexico. I have coordinated applied collaborative design studios, in which students work with local and state planning authorities to address problems such as flooding and lack of accessible, high-quality public space. These projects seek to improve urban infrastructure systems in ways that increase ecosystem services, such as improving water quality. For example, as part of the Border 2012 (precedent to Border 2020) program, the EPA provided funding for a pilot program to build flood-prevention detention ponds in Nogales, Mexico, a sister city with Nogales, Arizona. City leaders wanted to assess whether the ponds could also serve as public space amenities. Working with students from Arizona State University, my colleague Francisco Lara Valencia and I produced a report for local planning authorities. In it we proposed creating a network of connected green spaces to absorb stormwater and provide park lands, bringing nature into the city. By doing so, EPA and Mexican authorities could have a positive environmental impact on both cities. Top: The Rio Grande in eastern Ciudad Juarez today, with tourists photographing the border barriers on the American side. Bottom: The same site envisioned 10 years from now, with tourists photographing wildlife and a living river. I also worked with students at the University of Texas at Austin to create a green corridor master plan for the city of Hermosillo, Sonora in 2015. Green corridors typically run along natural or artificial waterways to soak up stormwater and provide places to play. The city is now launching a strategic plan that incorporates these concepts. In 2015-16 at UT Austin, we developed an urban planning and design strategy for border towns in the state of Tamaulipas that are expected to be impacted by oil and gas production resulting from recent energy reforms in Mexico. Our case study city is Ciudad Miguel Aleman, a border sister city with Roma, Texas, separated only by the width of the Rio Grande. The plan and designs propose to leverage construction of infrastructure for oil and gas production fields to include detention and filtration ponds and green corridors, which will serve as high-quality public spaces and mitigate flood risks. It also calls for creating natural preserves and recreation areas on the Mexican side of the river, mirroring existing areas on the American side. A green vision for the border region would expand this sister-city-specific approach into a large-scale urban ecology and planning effort. This initiative could integrate streets, parks, industries, towns, cities, creeks and other tributaries, agriculture and fracking fields throughout the Rio Grande’s entire 182,000-square-mile watershed. 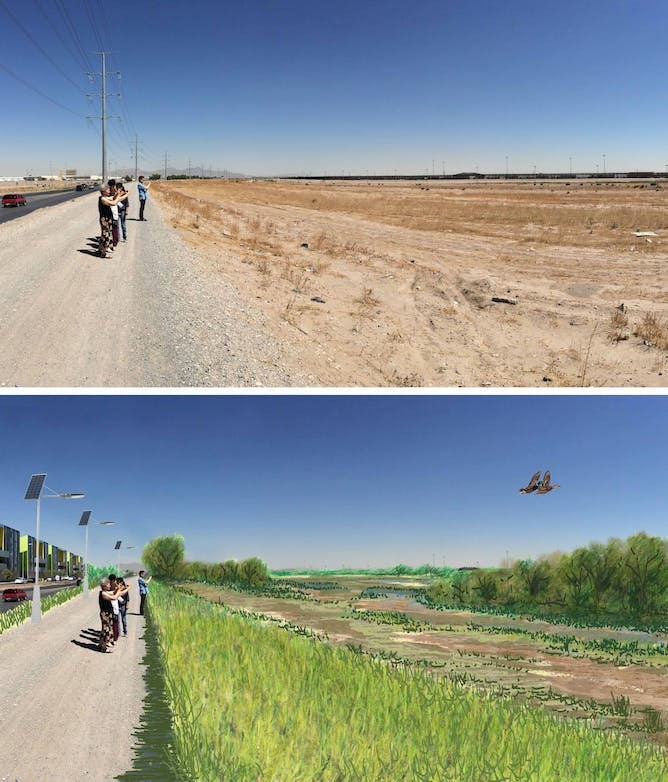 One possible starting point would be to restore riparian zones along the river through the binational metropolis of Ciudad Juarez, Mexico and El Paso, Texas, redesigning the existing channel. Recreating natural habitat on both sides of the river would cool and clean the air and provide attractive public spaces. But why stop there? 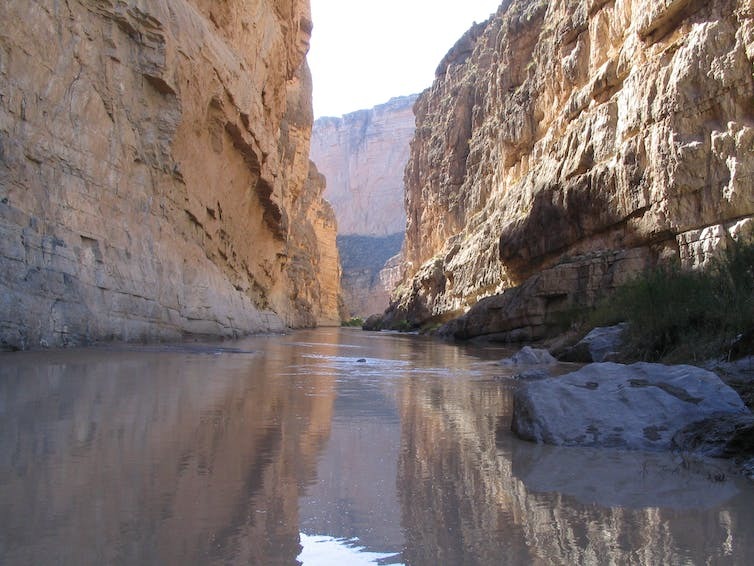 As the Rio Grande advances to the Gulf of Mexico, it cuts through incredibly valuable, beautiful and remote landscapes, including Big Bend National Park in Texas and the Cañon de Santa Elena, Ocampo, and Maderas del Carmen reserves in Mexico. Traveling its length could become a trip comparable to hiking the Appalachian Trail, with opportunities to see recovering natural areas and wildlife and learn from two of the world’s richest cultures. Discussions lapsed in the 1950s, then resumed in the 1980s at the grassroots level, but were drowned out by debates over border security and immigration after the September 11, 2001 attacks. 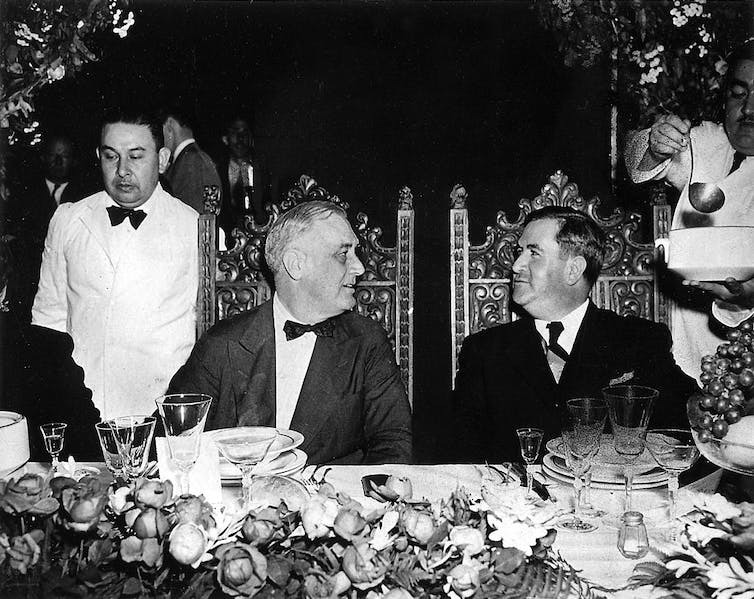 U.S. President Franklin D. Roosevelt and Mexican President Manuel Avila Camacho during a state visit by Roosevelt to Monterrey, Mexico, April 20, 1943. It is not clear whether Congress will provide the US$1.6 billion that President Trump has requested for work on a border wall. In any case, building a wall on a wide, inhabited river corridor with flood risks is a dubious goal. As experts have pointed out, it is more effective to police the border with technology and human power than to build a barrier. In fact, restoring river habitat could improve border security by fostering higher and more constant water flow. Making the Rio Grande healthier would also benefit farmers and energy producers on both sides of the border. 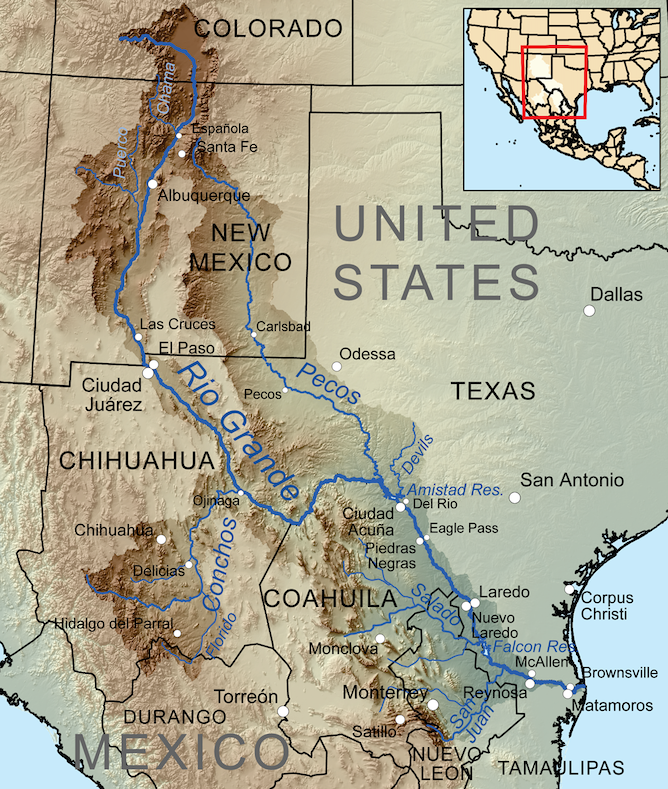 In his 1951 essay “Chihuahua as We Might Have Been,” American cultural landscape scholar J.B. Jackson wrote that “rivers are meant to bring men together, not to keep them apart,” and that the border imposes an artificial division on a region that humans accepted as one unified entity for hundreds of years – the Spanish Southwest. This vast shared watershed should remind us that we are fragile in isolation, but powerful when we come together. Gabriel Diaz Montemayor is an assistant professor of landscape architecture at the School of Architecture at the University of Texas Austin. Previously, Gabriel taught at The Design School of Arizona State University, Auburn University, and the Superior Institute for Architecture and Design of Chihuahua, Mexico. His research explores public space as a social and environmental integrator in the context of arid North America and the hybrid cultures of the expanded border region between Mexico and the U.S. through the means of multi-purpose landscape infrastructure, mobility, water management, public programs/services, and housing. He holds a Master of Landscape Architecture degree from Auburn University and an Architect title from the Autonomous University of Chihuahua. Follow Gabriel on Twitter @Gabphox. Editor's note: The views expressed by contributors to the Cynthia and George Mitchell Foundation's blogging initiative, "Can Texas's approach to sustainability inform a path forward for the U.S.?," are those of the author and do not necessarily represent the views of the foundation. The foundation works as an engine of change in both policy and practice, supporting high-impact projects at the nexus of environmental protection, social equity, and economic vibrancy. Follow the foundation on Facebook and Twitter, and sign up for regular updates from the foundation. This article was originally published on The Conversation.